For many IC students, FLEFF is one of the most anticipated cultural events of the year; it permeates the campus and offers participants a chance to make professional connections and engage in intellectual discussions. 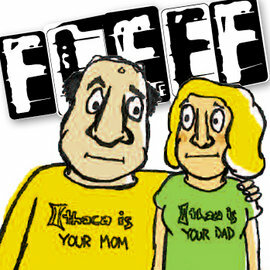 What festival organizers didn't expect was the amount of interest that FLEFF would hold for the parents of IC students. Attendance jumped from 3,000 guests in 2007 to 10,000 guests in 2008. One reason for the exponential growth of the festival is that many interns' parents came to see their children in action, but fell in love with the festival. "We've been two years now," says Tom Pelliciari, whose daughter Amanda Pelliciari '09 is a veteran FLEFF intern. "We had such a good time last year that we decided to come back, and we invited other people we know who enjoy films. And, when the weather broke, we got a chance to experience the falls and the Cayuga wine trail." That's another perk of visiting Ithaca during FLEFF; events are happening all over town and campus, so festival goers can pick and chose which events they are interested in and experience the Ithaca area in their downtime. It also offers parents the opportunity to mingle with the filmmakers and artists attending the festival. "We really enjoyed socializing at the after parties," said Pelliciari. "FLEFF has been known for its screenings, forums, music, films, and multimedia events, but this is the first year we’re giving people who attend the festival the chance to participate rather than observe,” said Patricia Zimmermann, who codirects the festival with Tom Shevory. "Some parents chose to use FLEFF as their parents weekend," says Zimmerman,"It gives them a chance to participate in an academic discussion with their sons or daughters and IC professors. And, at festivals, you have the opportunity to meet someone that you would not usually meet." "You can see films you wouldn't usually have the opportunity to see, and then you can also talk to the artist that produced it and discuss some of the concepts, or learn why a certain shot was done a certain way," says Pelliciari, who spoke to directors John Valadez and Arthur and Jennifer Smith. To make it easier for out of town guests, FLEFF has special discounted packages available at many of the hotels and spas in the Ithaca area. Make plans now to be at next year's festival!